I'm on my second cycle with the Divacup now and I think I'm having another problem..a leaking issue! The thing is, when I lay down and then get up maybe after a nap or something the seal breaks I think and then blood starts gushing out. -I squat when inserting, same with getting it out. -I use the model 1. -I can not afford another cup so switching to another brand or model is impossible. -I make sure my cup's suction holes are all I guess you can say they're all clear? They don't have anything blocking them. I am not sure if you could possibly be missing your cervix. 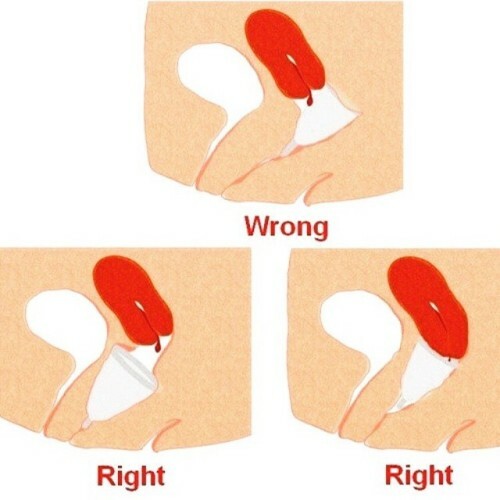 Check if the position of your cup isn't too high. Read the section about leakage at the end of http://kuradi8.livejournal.com/ and also consider flipping your Diva inside out to shorten it on your low-cervix days. I also have a high cervix and occasionally have had leaks. I don't have the DivaCup but have used several other cups. When you put the cup in try pulling it down a little bit. The cup might be too high up. I put mine in and when it is in the position I think is right, I pull down until I feel a slight resistance. I can't say that it will work for you since everyone is different, but I just thought I'd offer this advise on the chance that maybe it helps. second knuckle is not extremely low. i agree about flipping inside out. other cups are much more affordable than the diva. I would consider a wider cup if I were you. What you describe sounds like what I experienced when I used any cup under 44mm in diameter.